GBF President, Chuck Jonkel, surveying Hudson Bay. The Great Bear Foundation and Salish Kootenai College Media have been hard at work on a film project documenting the life and work of GBF President and pioneer of bear biology, Chuck Jonkel. Walking Bear Comes Home combines archival film footage of Jonkel’s historic polar bear research in the Canadian Arctic with interviews with Jonkel, his colleagues, friends, and family, to tell the story of one of the most interesting characters in wildlife conservation. 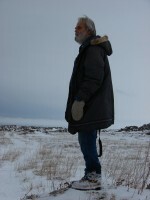 Jonkel developed the first capture-and-handling procedures for polar bears and black bears, developed the first database on Canada’s polar bears and their habitat requirements, co-drafted and signed the International Agreement on Conservation of Polar Bears, directed the first comprehensive study on the habitat requirements of the grizzly bear in the Lower 48 States, co-founded the Great Bear Foundation and the International Wildlife Film Festival, along with many, many more achievements that have helped to protect wildlife and habitat in North America and beyond. A preview of the film had its first public screening on February 2, 2013 at the FLIC Cinemafest in Polson, Montana. This project is sponsored by the Great Bear Foundation, Salish Kootenai College Media, The Cinnabar Foundation, Humanities Montana, and numerous private donations. To learn more about the film, or to donate to the project, click here.